Phew. I'm not even going to talk about April/May. 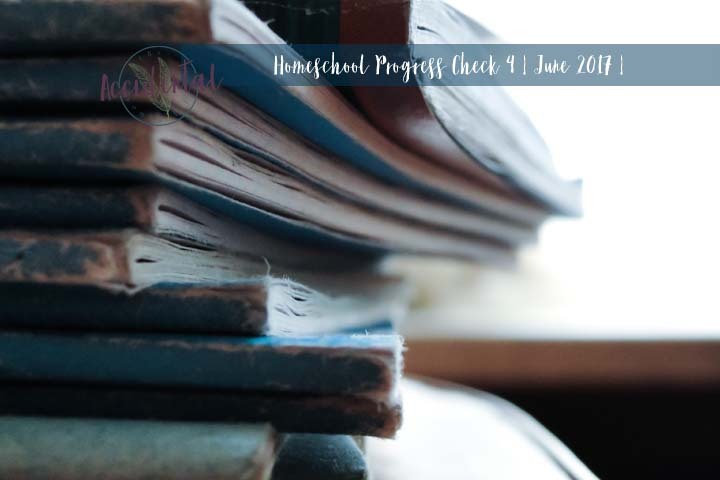 This month I'm just going to share with you some goals, plans for the summer, relay where the boys are at, and show you our new school space! Because we missed two months this spring, I decided that I'd like to continue with school through the summer. I plan on doing bookwork/hands on learning two days a week. This will help keep the kids "on track" for their ages and will encourage us not to get out of the habit of schooling. It may also help put us a little ahead for next fall in case there are issues with baby. I am also looking forward to doing Library adventures this summer. They have a whole list of things to attend regularly through the summer that sound like delightful trips for the kids! I have been contemplating writing my own curriculum to go through for this fall based off of the "10 Boys" books. My hope for doing this is to create a Christ-centered focus that would cater to both ages at the same time and also be useful for the following two in a few years! A friend graciously offered their past curriculum for me to go through and I was completely honored to go through and choose what I'd like for the next few grades to come. I also purchased the entire What's in the Bible? with Buck Denver 13 DVD set so that we can do some Scripture study this year! Cover fractions so he has a good concept of them. Cover telling time, well enough so he can tell me what time it is, or run a simple schedule himself. Cover money well enough for him to break down dollars beginning from $10, down. Have him reading his own devotional each night and journaling his own prayer. Recognize all the letters of the alphabet. Count to 20 by himself. Write his first name legibly. On to our new school space! I'm so pleased with it. 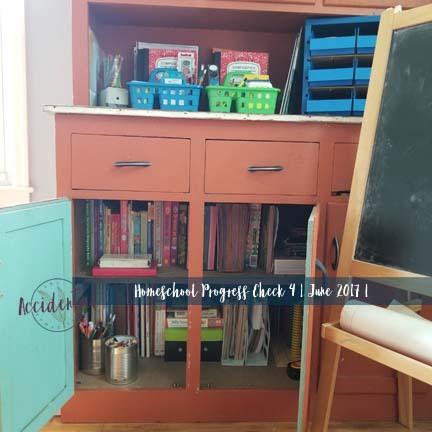 I began this past fall with trying to do a special desk for each boy and quickly realized that it just wasn't functional for our family and the space that we have to work in. 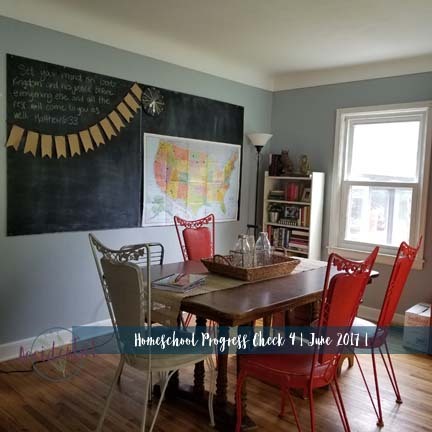 The dining room table is completely sufficient for our needs and it is easy to keep everything in one spot and (hopefully) easily organized. Our dining room table has been the best desk for the kids. I't has made it so easy to work with both of them, having one on each side. I decided to put our bookshelf in the dining room too. I'm really happy with the decision. I put my "pretty" school books on it so they're easy to access and nice to look at. Organizing school supplies was tough last year - I had such an over abundance of supplies that I wasn't using, or had stored for "the future" or "just in case." I went through everything shortly before we moved and got rid of the items I KNEW I wouldn't use, were SUPER old, or just irrelevant to my kids. I also decided to get rid of all the extra art supplies that Pinterest guilted me into keeping...Everything fits so nicely in my orange cabinet, and it makes resources easy to get to, but out of the way. 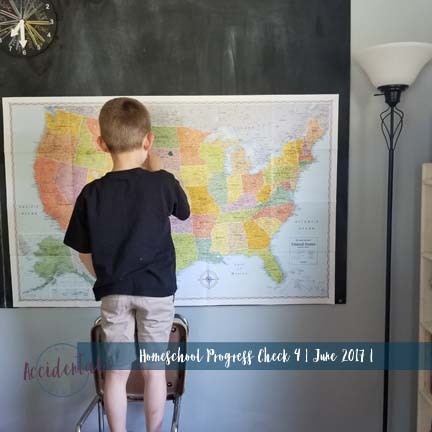 My latest purchase to enhance our summer learning is the United States map on the chalkboard that you see in the photo below. 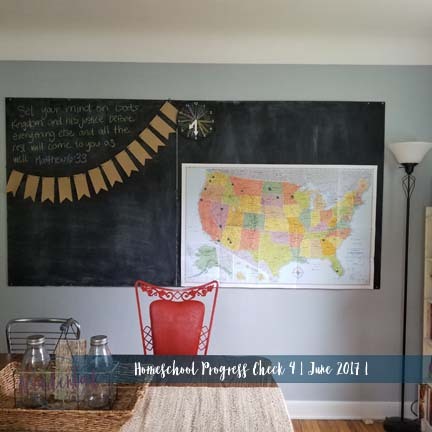 With Bennett's heart for missions, and his interest in geography and learning where we live and memorizing our address, I wanted to be able to enhance that somehow. We also have close family friends that moved to Florida, and my dad has traveled for work off and on for several years now - fun to track destinations! My Grandma recently left on a cross-country road trip excursion with a friend and she has diligently been sending the kids post cards from each stop she has made. Those are the blue dots that you see from Minnesota to Arizona! We looked at each postcard and Bennett found each place on the map by following main highways there. We haven't talked about North, South, East, and West yet, but his navigating skills have been impressive so far! We also have a world map that we will take a look at sometime later this summer. I am hoping to get things marked for the Lulu Tree, Indonesia (where our youth pastor and his family will be going), and other important places relating to missions that my children are familiar with. Overall, our school space is coming together so nicely and seems to be impressively functional for our needs. 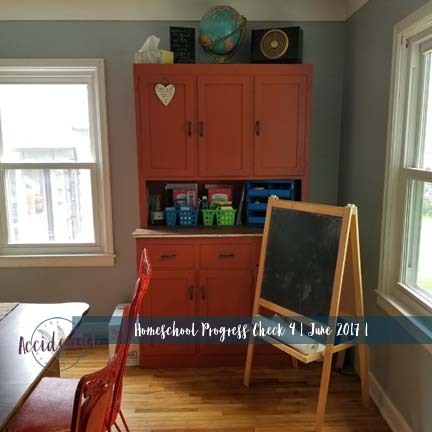 The kids are excited to have their things accessible, and I am looking forward to having a well curated supply cabinet. Tell me how you organize your school, or ideas that you have done, or will be doing for school this summer!